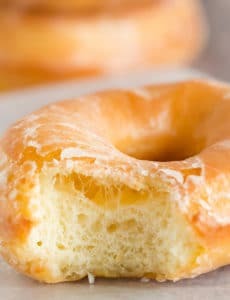 These doughnuts are light, airy and covered in a barely-there glaze, reminiscent of the famous Krispy Kreme doughnuts! Make the Doughnuts: Combine the yeast and water in the bowl of a stand mixer fitted with a dough hook. Let stand for 10 minutes. Add the sugar, salt, butter, egg, egg yolk, vanilla extract and 2½ cups of the flour. Knead on low speed until a dough begins to form. If the dough is quite sticky, add more flour a tablespoon at a time until a soft, tacky dough forms. The dough should clear the sides of the bowl, but not the bottom. Transfer the dough to a lightly oiled bowl, cover tightly with plastic wrap and place in a warm, draft-free spot for 2 hours. Gently press to deflate the dough, wrap in plastic wrap and refrigerate for at least 8 hours, or overnight. On a floured work surface, roll the dough out to a ½-inch thickness. Using a doughnut cutter (if you don't have one, use one larger and one smaller round cutters) dipped in flour, cut out the doughnuts and place on a parchment-lined baking sheet. (You can roll any leftover dough scraps into balls for more doughnut holes.) Cover with a clean dish towel and allow to rest for 1 hour. Line a large rimmed baking sheet with a double layer of paper towels and place a wire cooling rack on top. When ready to fry, heat the vegetable shortening in a large cast iron skillet (or other wide, heavy-bottomed skillet or pot) to a maintained temperature of 360 to 370 degrees. Gently lower the doughnuts into the oil, being careful not to overcrowd the pan (I cooked in three batches). Cook until golden brown, about 1 minute per side. Carefully remove the doughnuts from the oil and place on the cooling rack. Repeat until all of the doughnuts have been fried. Make the Glaze: In a medium bowl, whisk together the powdered sugar, water and vanilla extract until smooth. Working one at a time, dip each doughnut into the glaze, flip to coat the other side, and return to the cooling rack. Allow the glaze to set for about 15 minutes, then serve. Note: My husband said that reheating leftover doughnuts for 8 seconds in the microwave is perfect!